See no spoilers. Hear no spoilers. Speak no spoilers. First of all, on behalf of those who LOATHE spoilers, THANK YOU for being here and for doing your part to rid the world of the evil that is spoilers, thus restoring the joy of a “first watch” (or “first read” or “first playthrough”) to the whole of humanity…yes even to those who are a little (or a lot) behind. Why would you want to rob another of the same satisfaction you had when watching/reading/playing for the first time, knowing only what the writer intended you to know only as the writer intended for you to learn it? Friends DON’T spoil friends’ watching/reading/playing enjoyment. Don’t get me wrong: there are some people who are anti-spoiler to the extreme. These are the people who refuse to watch trailers or teasers, who don’t follow (on Twitter) those involved in a project until the project is over (I’m not referencing those who don’t follow a project they’re behind on, but rather those who are caught up on a series but still don’t follow). Let’s be honest: those people shouldn’t be on the internet. That said, let’s talk about what a spoiler ISN’T. A spoiler IS NOT (or “is not USUALLY”) knowledge that a certain actor will be in a show/movie…UNLESS that actor is a pre-established and already killed off or otherwise departed character in the universe in which the show/movie takes place; and even in this case, oftentimes a returning actor DOESN’T mean a returning character, but rather a memory/flashback, dream, or even ghost (or other supernaturally explained occurrence). HOWEVER, since this is more of a gray zone, and since there’s not a unanimous opinion on if it is or isn’t a spoiler, you should probably avoid returning actors (without the use of a spoiler alert) if you want to practice perfect spoiler etiquette. A spoiler IS NOT (or “is not USUALLY”) any information that can be gleaned from a trailer or preview. This information is given not to spoil the show or movie, but rather to engage the audience. Generally, those involved in a project don’t want the project spoiled, so you can usually trust “official” information (unless, for example, you’re behind on a TV show). Many people who claim to practice good spoiler etiquette also claim that there is an expiration date on a spoiler, that after a month or a year, or five or ten years, anything is fair game because “if you haven’t seen it yet, you’re probably not going to,” and/or “you deserve to be spoiled.” Pardon me for saying so, but that’s just douche-baggery. There are literally millions of books, TV shows, movies, video games, etc. To insist that the entirety of the world has to see/read/play them all when they’re new is ridiculous (and impossible). Good, watch-worthy television shows air in the same day and time slot on different channels all the time. “But you can always watch it the next day (or a week, or even a month) later.” Some people can’t…and for all kinds of reasons! In North America, East Coasters get episodes of television shows hours before West Coasters do; TV episodes don’t air in some countries until weeks after they air in the U.S.; and movies release up to months later in other countries. Or maybe it’s due to other adult responsibilities (no one said being a grown-up was all fun and TV shows/movies/books/games). That’s not even to mention the money side of things: a gamer (or avid TV/movie watcher or book fan) could choose to fall behind on their mortgage so they don’t fall behind on pop culture, but that’d be unwise. And some people even still prefer to wait until it’s on Netflix/DVD/Blu-ray so they can watch it all commercial and break free! Whether location-, time- or money-wise, you can’t do everything at once (or maybe you don’t want to), and it all stacks up putting you weeks, months, or even years behind. That doesn’t mean you don’t deserve the same experience your buddy who lives in his mom’s basement and doesn’t have a job or bills got because he didn’t have other obligations. And all of this doesn’t even take into consideration the “new fans”. Should my friend (who I’ve badgered relentlessly about watching Firefly because “it’s so gorram good” not get to experience Serenity for the first time as I did? Serenity is so good, in part, because of the suspense and emotional toll it takes on your soul when–well, if you’ve seen Serenity, you now what I’m talking about; I mean, to be fair, warning my friend not to get attached or to prepare himself would be a piece of mercy, but it would take away from the experience as a whole. What about the crazy twist in The Sixth Sense or the one in Fight Club? Knowing *spoiler spoiler spoiler* going in would have ruined the movie for me. Why would I do that to someone else, especially to a friend? Oh and before I forget! Beware of the phrase “I’m not going to spoil it, BUT…” I can’t count how many times a serious spoiler has been preceded by the phrase “I’m not gonna spoil it, but.” Even if you THINK you’re good about not spoiling stuff, if someone hasn’t seen/read/played something, err on the side of caution and just STOP TALKING until they’ve done so! Of course, there’s also common sense that has to be used when it comes to not being spoiled. The most obvious example of this (and the only one I can think of) is: don’t go into an all-Firefly conversation/event/article and expect the Browncoats to hold their tongues; that’s a safe zone where fans don’t have to watch what they say…which brings us back to spoiler etiquette: If you’re at a Firefly event, all Firefly stuff should be fair game, but spoiler etiquette DOESN’T spoil other shows (ie: don’t talk about Buffy just because you assume that if they’re Firefly fans they’re also Buffy fans, as this assumption would be wrong half of the time). Long story short, a person practicing good “spoiler etiquette” (read: a friend) DOESN’T TELL that which they’re glad they didn’t know going into a TV show, movie, book or video game. A friend asks questions first and uses spoiler alerts like a gun safety! You don’t want to accidentally blow your friend’s brains out, and you shouldn’t want to blow their minds and ruin that awesome piece of fiction for them either! Some people LOVE spoilers; they eat them up. They google what happens WHILE watching the TV show or movie. They read the end of the book FIRST. There are entire websites dedicated to spoiling good plots! Some people love spoilers, but most people DON’T. So please, spoil responsibly: use a spoiler alert!!! SPOILER ALERT FOR [insert TV show title here]! SPOILERS INCOMING! DON’T SCROLL DOWN UNLESS YOU’VE SEEN THE LAST EPISODE. YOU HAVE BEEN WARNED!!! Share this post to help fix the internets…and the world! Have something you’d like to add? Let us know your thoughts on spoilers. Want to publish your own writing? Take a look around to see what we’re about, and contact us with anything you want to write for us or read from us. 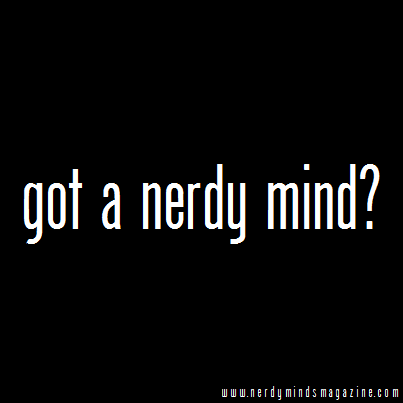 got a nerdy mind? Stay tuned to Nerdy Minds Magazine on Facebook and @NerdyMindsMag on Twitter for more nerdy news, reviews, interviews, deals, and more! You can even subscribe to have each new post delivered straight to your inbox so you’re sure you don’t miss out!